Baggerman is a leading European distributor, market leader in the Benelux and also internationally known as a specialist for Rubber hoses, PVC hoses, couplings and all kinds of other appendages. As a result of a clear policy regarding a good price, quality and service level Baggerman BV, over the years, grew out to be a mid size international wholesaler and producer employing 45 people and registered a total of over 35 product names. Baggerman BV is located in the Netherlands, Italy, Switzerland, Hungary and Romania. 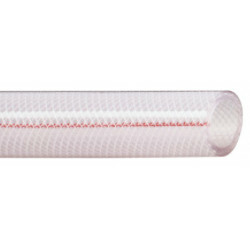 PVC Air pressure hose for air and water, restricted chemical resistant. Non-toxic PVC&nbsp;quality. Longitudinal red and blue marking yarns. Extremely good quality.&nbsp; Temperature range : -20&deg;C / +60&deg;C.